Abu Dhabi has taken another step toward becoming an international cruise hub following the signing of a co-operation agreement between the Abu Dhabi Tourism Authority and Italian cruise line MSC Cruises. 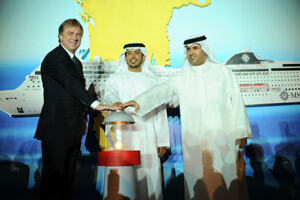 The agreement will see the world's fastest growing cruise operator using Abu Dhabi as a homeport from October 2011. The terms of the partnership will see the MSC Lirica based out of Abu Dhabi for the cruise line's maiden season in 2011/12. The 2,200 capacity ship will will offer 19 cruises over five destinations between November 2011 and March 2012. Mubarak Al Muhairi, Director General, ADTA announced "MSC Cruises’ commitment to Abu Dhabi as a homeport will deliver both tactical and strategic outcomes for the Emirates... Beyond the substantial, broad-based benefits to our domestic tourism sector through incremental gains in hotel guests, longer length of stay and greater spending, this partnership provides Abu Dhabi a firm footing on the international cruise tourism map and reinforces the strategic case for a world-class, purpose-built cruise terminal in the emirate." Pierfrancesco Vago, Chief Executive Officer, MSC Cruises said "MSC Cruises is proud to become the first cruise company to choose Abu Dhabi as a homeport... With our state-of-the-art vessel MSC Lirica operating 95 calls and 19 rotations in the region, our presence will have a significant impact on the tourism industry of Abu Dhabi... We see Abu Dhabi as an exciting cruise destination which has already proved immensely popular with international tourists... MSC Cruises will be an important catalyst in driving growth in cruise tourism in the region. After having discovered the UAE and their exciting attractions from our luxury ship, visitors will come back again, as they always do, further boosting the development and promotion of local economy."